Double amputee Rudy Garcia-Tolson, crushed Paul in the swim. Brief side note for today. For years, Mockingbird has supported my brother’s fundraising efforts for the Challenged Athletes Foundation – a non-profit that provides grants to help physically challenged people with the tools they need to pursue an active and healthy lifestyle. Their seminal event was held last weekend – a triathlon in San Diego. The other highlight of the Celebration of Abilities evening was the introduction of these sixteen members of the US Paralympic team (45% of the US team was supported by CAF) who had returned from Rio, many sporting medals of gold, silver and bronze. Hearing their passionate description of the life changing experience was inspiring. 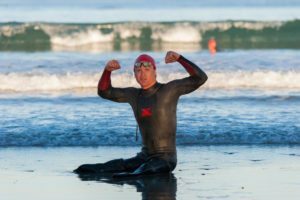 As part of the second wave of Gold Team members who had raised significant funds above the minimum requirements, I dove into the water on the heels of 94 Challenged Athletes who had entered in the first wave to start my mile swim. Twenty-three minutes later I was the first Gold Team member to exit the Pacific. My enthusiasm was only slightly tempered when Lisa noted that I had swum about thirty second slower than Rudy Garcia-Tolson a double leg amputee who had led the Challenged Athletes wave. To my Mockingbird clients – a trickle down thank you for making my support of this outstanding organization possible.